Instant Pot Old Fashioned Meatloaf - Recipes That Crock! Need dinner in a hurry? 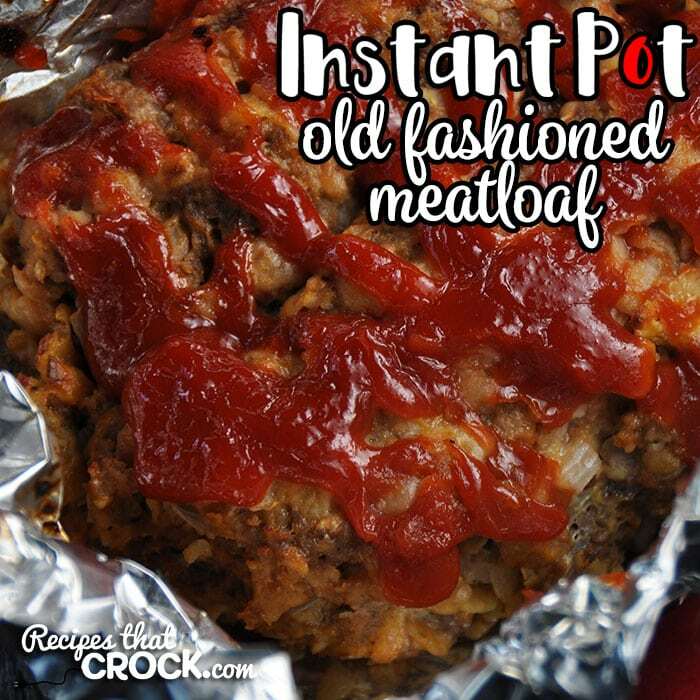 This Instant Pot Old Fashioned Meatloaf takes our tried and true, super simple Old Fashioned Meatloaf recipe and turns it into an Instant Pot recipe! 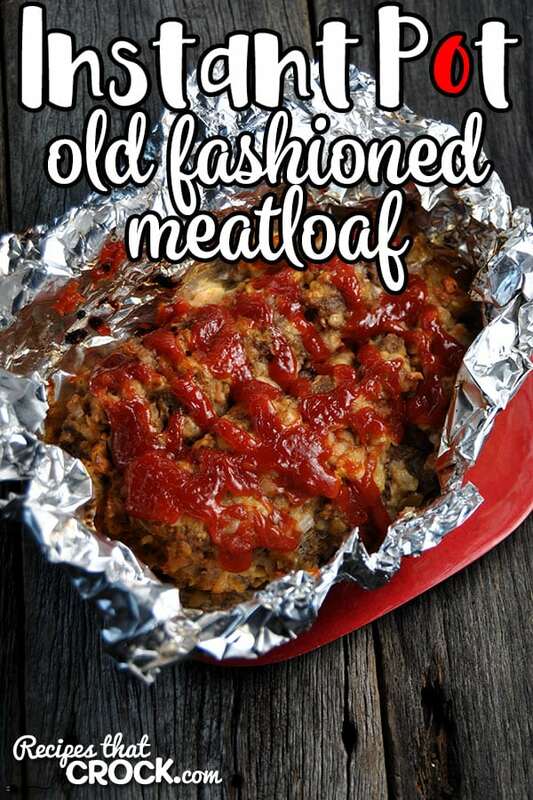 Momma’s meatloaf always has been and always will be one of my favorite recipes. So much so that I made it into a crock pot recipe AND had a blast doing a cooking video of the crock pot recipe with Mikey. It also freezes well, so if you don’t need as many servings, you can always freeze some to have a quick dinner for later! It only makes sense that I would give it a try in my Instant Pot! You guys are gonna LOVE this! 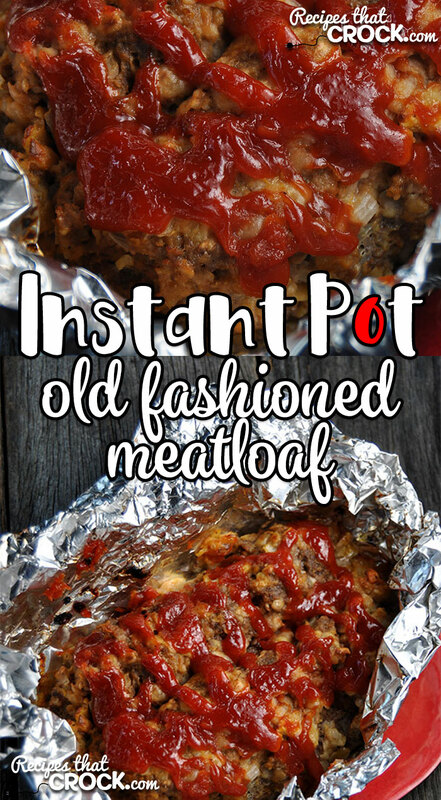 Meatloaf has never been so easy! Mix together your ingredients (except the extra ketchup for topping and water) and mold into a loaf. Make a dent down the middle of your loaf. Place your loaf in a greased “boat” made of aluminum foil. Pour your water in your 6-quart Instant Pot. Place your loaf boat in your instant pot (making sure the sides are much higher than the water). Place the lid on your Instant Pot and seal. Set on the meat setting for 30 minutes. Let it naturally release for 10-15 minutes. Quick release and serve! Electric pressure cooker units may cook differently, so cooking times are always a basic guideline and should always be tested first in your own unit and time adjusted as needed. Mix together your ingredients (except the extra ketchup for topping and water) and mold into a loaf. Make a dent down the middle of your loaf. Place your loaf in a greased “boat” made of aluminum foil. Pour your water in your 6-quart Instant Pot. Place your loaf boat in your instant pot (making sure the sides are much higher than the water). Place the lid on your Instant Pot and seal. Set on the meat setting for 30 minutes.